Life with an autistic sister can seem tough for a tween who would like to be getting out and about doing more activities, so we try to build special quality time in for our eldest when we can. 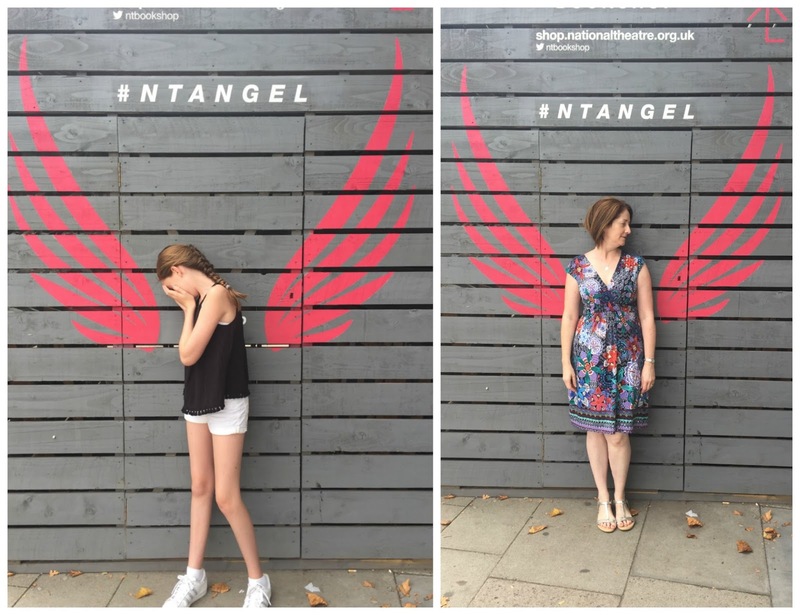 This summer I planned a girls' day out in London, and it was probably my favourite day of our whole summer. Maybe even of the year. When the 'shopping' request came in (she is a tween, after all), I'd already decided I wanted to take her to see a show because I love shows, and so I felt it only fair to add a little bit of shopping onto that. So I was actually secretly pleased when she also requested a trip on the London Eye. I have done it once before myself, but that was years ago and I wanted to experience it again, with her this time. We booked online the night before using out Tesco vouchers (top tip from a friend) and picked an early slot in the day to try to avoid queues, and also so we had plenty of shopping time left after. The train we had aimed to take was cancelled and there were several delays when we turned up at the station, but luckily one train seemed to appear out of nowhere and got us to London on time! We ambled along the South Bank, enjoying some great photo opportunities, then grabbed a quick lunch to take on board with us before we headed to the queue. Luckily though, there was barely any queue and we were impressed with how the London Eye staff kept everyone moving in a polite and friendly way. Before we knew it, we were boarding our capsule, keeping our fingers crossed we wouldn't be in the one with the crying baby.... we ended up with the screeching toddler instead, oh joy. Fortunately that was only on the way down so we still enjoyed our ride immensely. There was a particularly funny moment when a young lady begged her older mum to take her photo, and the mum pretty much crawled off the seat in the middle then hung on for dear life as she stood up - something tells me it's not the best attraction in London for those with a fear of heights! I'll admit my legs did go a little wobbly as we approached the top, but the views definitely made up for that feeling. When we got off the Eye, we made our way to the free 4-D experience in the ticket hall nearby. Free! I don't want to spoil the experience by telling you what happens, but I urge you to go and see it - you don't even need to show your ticket for the Eye. I loved it, thought it was very clever! Next we headed over the bridge, felt sorry for poor old Big Ben with the scaffolding and for the tourists who can no longer get a 'perfect' photo, and we strolled along Birdcage Walk on our way up to Buckingham Palace. Tamsin wasn't all that keen on our detour as she was keen to get to the shops but we laughed as I cajoled her along the path and we joined the crowds at the famous gates. More photos, and then a cut through Green Park to the tube to take us for our Oxford Road shopping frenzy. Lush was a big hit - tween heaven - then we paused for breath in Costa (where my little girl looked all grown up having bought new jewellery). Next was another tube ride to the huge Primark in search of their Harry Potter range. We struck lucky with both the goods and a short queue and then made our way over to Victoria, where we were off to see the show Wicked. First though, a stop at our favourite, Pizza Express, where purchased goods were explored and enjoyed. Wicked was, well, wicked! There is not much I love more than a good West End Musical; I've seen a few and this is definitely in my top five. An amazing show which I'd recommend to everyone. To help us to remember this fab day out, I've put all the pics (there were more, of course!) into one big slideshow, which I'm not expecting anyone else to watch, but you're more than welcome. I'll just finish up by saying that I do highly recommend the London Eye, the South Bank, Buckingham Palace, Oxford Street shopping and the West End theatres as great experiences for those visiting London (and I'm not being paid to say that! ).